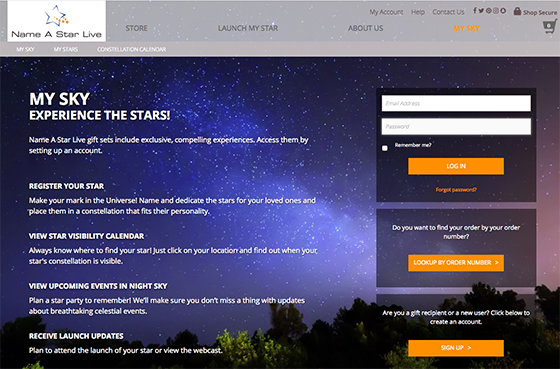 The “My Sky” section of the Name A Star Live website. If you created an account with us before, log in with your username and password. If you don’t remember your password, you can create a new one. NOTE: Please do not create a new account now and expect to find your Launch Certificate — the system does not work that way. If you did not create an account with us in the past, then use the “LOOKUP BY ORDER NUMBER” option. You will find your order number in the extreme, lower, right-hand corner of your Star Certificate. You’ll also find this number in your e-mail receipt we sent you at the time of purchase. 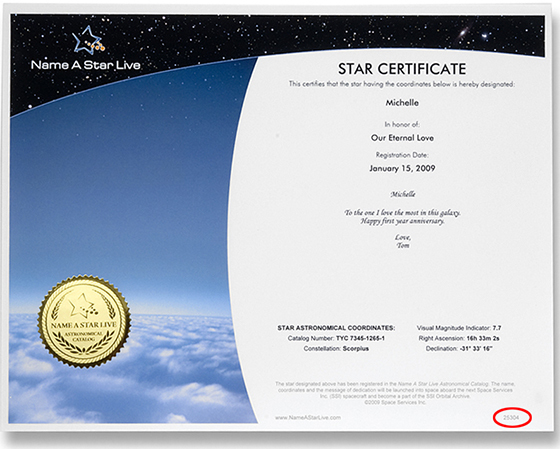 Your Order Number appears in the extreme, lower, right-hand corner of your Star Certificate, highlighted in red here. 3. 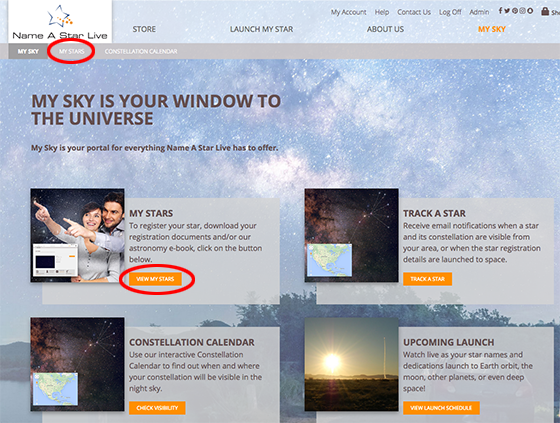 You should automatically be taken to the “My Stars” section of the site. If not, click on either of the “My Stars” links in My Sky. The “My Stars” links are highlighted in red in this image. 4. 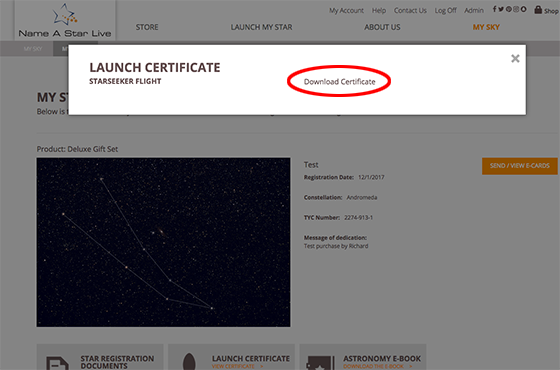 Now that you’re in “My Stars,” click on the “LAUNCH CERTIFICATE” link. 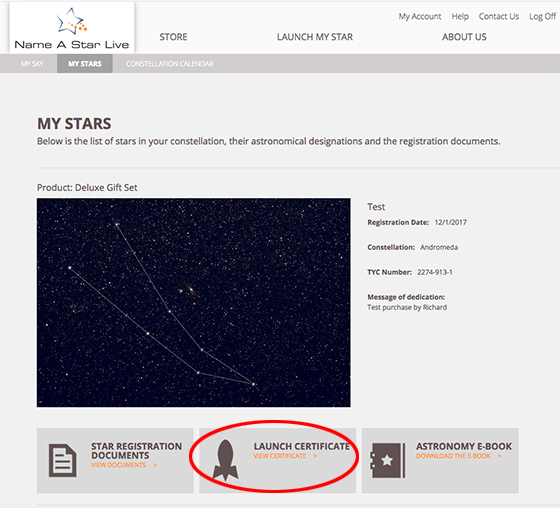 In the My Stars section, click on the “LAUNCH CERTIFICATE” link. 5. A Starseeker Flight popup box will appear. Click on “Download Certificate.” A letter-size PDF file will then download to your computer. For the best effect, we recommend printing this letter-size PDF document on glossy or photographic paper. You may print this document as many times as you wish. Click on the “Download Certificate” link. Previous Previous post: Spooky Sights and Sounds from Outer Space!